It was a warm summer day and the music playing throughout the large dining halls of Baku Palace Restaurant was unmistakably Azerbaijani. The food was identical to that served in many of the restaurants throughout Baku. And the beautiful, lively children who were gathered in the room were all from the same country-whose flag of blue, red and green was prominently displayed. But this was not a celebration on the shores of the Caspian. It was a Saturday afternoon in a beautiful new restaurant near the ocean off Sheepshead Bay, a residential neighborhood of Brooklyn in New York City. The adults were speaking English, not Azeri. And the red, white and blue of the American flag was also proudly displayed next to Azerbaijan's flag. 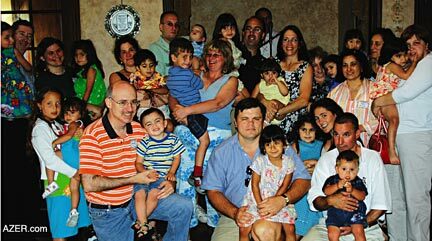 "Celebrating our Families," the Third Annual Reunion of American families with children adopted from Baku, was in full swing. The children danced spontaneously to the lilting melody of the popular children's song "Jujalarim" ("My Little Chicks") while parents, grandparents, siblings and friends traded stories of what it had been like to adopt children from Azerbaijan. Photographers and reporters from local newspapers moved through the crowd, while a production crew from a Russian-American TV station recorded the event. 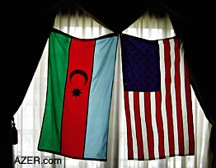 Left: Flags from Azerbaijan and U.S. were displayed together at the Baku Palace Restaurant in Brookly, New York, where the Annual Adoption Reunion took place, July 2004. Some families had traveled 3,000 miles across the entire United States to be there, while others came from just a few miles away. Some of the adopted children had joined large families, while others had joined as the only child of a single parent. But all the children had one thing in common: as infants and toddlers, they had slept in the same rooms and played with the same toys at an orphanage in Baku, Azerbaijan. Now these "Baku Babies", as their families affectionately call them, were all American citizens living with American families. The three-day weekend reunion took place on Friday through Sunday, July 9-11, 2004, at an event which had been organized by volunteers-adoptive parents Gina Andriolo and Jane Bottner, both New York City residents, with the help of Eileen Ordu. Tomris Azeri, President of the Azerbaijan Society of America, of Newark, New Jersey, had also provided significant support. The weekend was full of activities. On Friday, July 9, some families gathered in the historic South Street Seaport in Lower Manhattan and ate at Carmine's, an Italian restaurant. On Saturday, the families, totaling about 70 people, gathered at Baku Palace, an elegant restaurant about 30-minutes from Manhattan. Families from Across the U.S. The reunion drew families from across the United States-from Connecticut (Beckett), Kansas (Kile), Missouri (Shifrin), New Jersey (Caust, Grabowski, Lubicky, McDevitt and Munsche), New York (Adams-Kahn, Andriolo-Contrino, Bottner, Ordu and Rudnick), North Carolina (Soos), Pennsylvania (Segal), Tennessee (Abernathy), Virginia (Cordts), and Washington (Boaz). Below: Betty Blair, Editor of Azerbaijan International, with children's art instuctor Galina Nikolayevna in Azerbaijan International's office in downtown Baku, selecting art works for the Third Annual Adoption Reunion in the U.S. - "Celebrating Our Families". 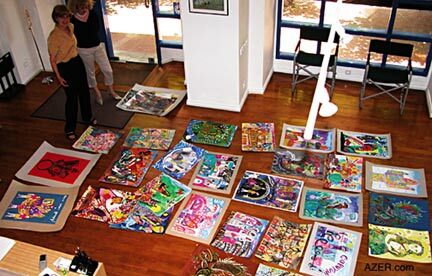 Fifteen works were selected from three art teachers. More than $1,000 was raised at the reunion's Silent Auction from the paintings and other handcrafts. The money was directed to the United Aid for Azerbaijan for the care of children in orphanages in Baku. June 2004. For some families, it was their second reunion (Abernathy, Bottner, Kile and McDevitt). 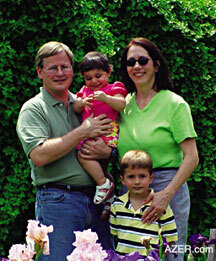 The Shifrin family had attended all three reunions-Nashville (2002), Kansas City (2003), and New York (2004). The idea for a reunion came from Kimi Abernathy, whose daughter Inara was the first child adopted internationally from Azerbaijan in 2000. Kimi also was the driving force in creating the Yahoo Internet ListServ-AzerbaijanAdopt-to which many adoptive families subscribe. She also hosted the first reunion in 2002 in Tennessee. 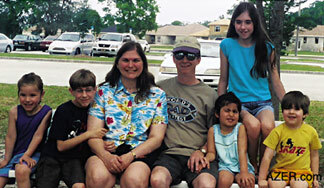 In 2003, Kathleen and Jim Shyrock, along with Judy Shifrin, coordinated the reunion in Kansas City, Missouri. In New York City, reunion coordinators were thrilled to have Baku Palace-the only Azerbaijani restaurant in the United States-as a venue to provide the tastes, sounds and atmosphere of Baku. The menu was full of Azerbaijani favorites: fresh vegetable salad (chopped tomatoes, cucumbers and greens), red lobio (fried eggplant in vinegar garlic marinade topped with chopped walnuts), feta cheese, dolma (grape leaves stuffed with ground lamb and rice), gutab (crepes stuffed with ground meat or greens and gently pan fried), sigars (thin layers of dough stuffed with feta cheese), lula kabab (ground lamb wrapped in pita bread) and chicken kabab. Pakhlava (bakhlava) and Skakarbura were offered as pastries for dessert. Live Azerbaijani music kept both the children and adults on the dance floor for much of the afternoon. Following the precedent set at the 2003 reunion, a Silent Auction and Raffle were held. Together these activities raised more than $1,000 for United Aid for Azerbaijan to help fund programs to strengthen the care of children still living in orphanages in Azerbaijan. The Silent Auction consisted of more than a dozen artworks created by Baku child artists, selected and brought from Baku by Betty Blair, Azerbaijan International's editor. Again this year, the children's art works were offered by three teachers-Katana Sharifova, Galina Nikolayevna and Inna Kostina. Javid Mammadov's pen and ink drawing of Baku's Old City was so much sought after that it attracted nearly 20 bids and brought more than $100. Tomris Azeri also organized for several handicraft items to be auctioned, including two dolls in traditional Azerbaijani costumes. On Sunday, some of the families gathered again-this time in Chinatown in downtown Manhattan for a Dim Sum Brunch. From there, they visited the Central Park Zoo. It had been a weekend full of fun, food, music and camaraderie, which brought together people from all parts of the United States who had shared one very important adventure-their journeys to Baku to fulfill dreams for their families. 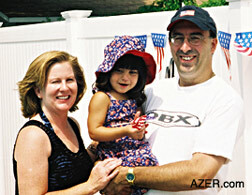 Yet, despite all the similarities shared by families who have adopted children from Baku, each story is unique. Some of the families who attended the New York Reunion share their stories here. 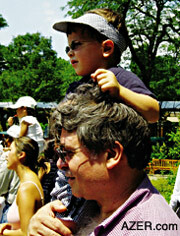 Back in May 2002, a little over two years ago, I brought my son, Benjamin Rovshan Bottner, from Baby House No. 1 in Baku. It was the beginning of our life's journey together as a family. Ben was almost two years old, but he was so much like an infant both in size and ability. He could not walk, or even stand up or crawl. He had no expressive language skills. He weighed only 17 pounds and had only four teeth. Yet Ben's big bright brown searching eyes and his warm smile indicated an intelligence, curiosity, and keen sense to learn despite his weak physical state and developmental delays. Today, Ben remains that curious, observant, intelligent little boy that I brought home two years ago. Now these characteristics extend far beyond the intensity of his searching eyes and are always present in the way he moves his body, the questions he asks, the things he observes and in his joyful enthusiastic spirit. Ben loves to talk and explain how things work. He runs, climbs, pedals a tricycle, loves to swim and draw. He has a funny sense of humor, and an infectious laugh that lights up a room, bringing smiles to all. There are so many precious things about this little boy, our son, Andrew Mario Contrino, that we can hardly believe our fortune that he is a member of our family. His sleepy eyes light up first thing in the morning when he sees us. Then there's his funny little jokes, his laughter, his kisses, his endearments-"You know what? I love you SO much!" Andy's adoption from Baby House No. 1 was such an adventure. We were so eager to bring him home as our special Christmas present-this little boy whose birthday is December 25th. When he arrived just a few weeks prior to his second birthday, there were so many fundamental things that he couldn't do. He couldn't walk, talk or even crawl. And he was so small. But Andy had a charismatic personality, a smile that would not stop and an overwhelming charm and charisma that immediately captivated his parents, grandparents, family and friends. His progression from that sweet little baby to a rollicking, talkative, inquisitive and confident little boy has been amazing to watch. At 3 12 years old, Andy can now name and recognize every bridge in New York City. He can recite the American Pledge of Allegiance to the flag. He knows his numbers, letters and colors, and talks all the time-sometimes even sprinkling his conversation with some Spanish and Italian. He certainly keeps us on our toes! This is a story of a great love. 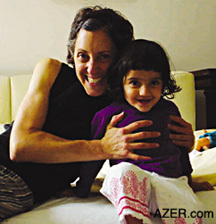 It is Katarina's story who was adopted from Azerbaijan. She's really no different from any of us, but she does have a special beginning, one that enabled us to become a family, 17 months into her life. We met Katarina for the first time in the spring of 2002. For us, it was the most important moment of our lives. Katarina's referral came on a day just like any other. The most beautiful words we've ever heard were: "We have a little girl for you. Shall we send her picture?" We had waited for that call for so long, and when we finally saw Katarina's photograph, she took our breath away. She was perfect. We couldn't hold back the tears when we realized that she was to become our daughter. We will always have a special place in our hearts for the city of Baku and for the staff at the Baby House who cared for our daughter all those early months of her life. Our baby girl has blossomed into a wonderful little girl full of life, full of love and, most importantly, full of happiness. It has been two years since we arrived home with Zaccary. He has changed so much since then-as all babies do. But seeing the solemn tike we brought home blossom into a mischievous cute little flirt makes us marvel every day when he greets us in the morning. He has recently started singing, mostly nursery rhymes that he hears so often. His favorite is "Twinkle, Twinkle, Little Star" and he launches into this little melody every time he sees a star of any kind. He's our star. Time and love change so much. And, with Zaccary Caust, we are having the time of our lives! We've just been sitting here working on Alaina's scrapbook and marveling at how much she has grown and developed in one year. A year ago in 2003, we were in the waiting stage between our first and second trips to Baku. I look back on those photos that we made of her on the day we took her from the Baby House. She was crying so hard. It makes us almost cry to think about how scared and confused she must have been. Here were these strangers taking her away from everyone and everything that she had ever known. But as soon as we got in the car to drive away, she stopped crying and since then, she has eagerly embraced all the new things that have come her way. She is a sweet, good-natured, funny, smart, delightful girl. We are so blessed to have Alaina Cordts in our lives. 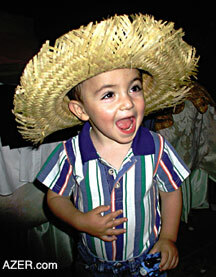 I first met my son, Jacob Chalmers Rufat Boaz, on July 21, 2003, when he was 10 months old. That day I spent two hours with him at Baby House No. 1. I remember he was so very quiet. He would just sit still. He didn't crawl or move around very much. He just looked at me very somberly. Within an hour of bringing him with me on that second trip to Baku in September, he was a completely different baby. Jacob was smiling and inquisitive and immediately started taking his first steps! Within 24 hours, it was clear that Jacob understood that I was more than a temporary caretaker. No one else could hold him-he only wanted his Mama! From the beginning, It was obvious to us that Jacob had a strong intellect. He loves books, whether it's having someone read to him or just looking at them on his own. Now he is nearly two years old; and he can recognize all the letters of the alphabet, knows about 15 colors, and he's starting to count. He is passionate about cars and trains. He's very sweet and gentle and has a wonderful sense of humor. I can't imagine my life without Jacob in it. He is the greatest joy and blessing I could ever hope for, and I look forwarding to watching him grow and develop through the years. My daughter, Julia Edith Ordu (named after my own grandmother), was adopted from Baby House No. 1 in Baku in December 2002. Despite it being the coldest winter Baku had experienced for decades, I had the fortunate opportunity while the adoption process was being finalized, of spending the waiting period in Baku instead of making two trips there. My stay extended into two months. While there, I was able to meet and talk with Azerbaijanis from all walks of life, and to learn a bit about Azerbaijan's rich culture and history. I was also able to visit Julia regularly. At that time, she was very weak and stiff and had the skinniest little arms and legs. She used to twirl her tongue and her wrists, and she could neither sit up nor roll over. 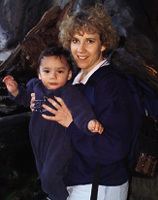 We arrived home in February 2003 and Julia was soon babbling away. She began to crawl at 13 months and was walking at 16 months. People commented about how strong, sturdy and confident her steps were. Today, Julia is bright, athletic and extremely social. She laughs heartily and loves to talk and tell stories. She is also very musical. She loves to dance and sing loudly as she marches around the house, elbows out, and knees drawn high. She is generous, loving and affectionate and always in good spirits. Julia is so much fun to be with. She's a joy, a treasure, to me and to all the loving people in her life. Left: Soos Family: Noreen, daughter Katrina and Michael. Who would have thought it possible? When we first received our adoption referral and learned of our daughter Katrina's birthday, we could hardly believe it. But it was true. Katrina Soos was born on the 4th of July in Baku, Azerbaijan! We made two trips to Azerbaijan in October and November 2002. From the first time that we met Katrina, we knew she would be a very happy child. She was always giggling and laughing. She had a great big smile. The orphanage and our in-country coordinator told us that since this was our first child, they would choose one which easy to raise. How true that statement was! Katrina always wakes up with a big smile and loves to hug (especially other children). She is extremely adventurous and loves to swim and will even jump off the diving board by herself. She also loves to dance and sing. We are so blessed to have her. We're very grateful for the country of Azerbaijan in giving us the opportunity to adopt Katrina. We are currently awaiting our second adoption from Azerbaijan; Katrina can't wait to meet her new baby sister. We are also very fortunate that there are four other families near us in Charlotte, North Carolina, who have adopted from Azerbaijan as well. We get together monthly so that our kids can play and socialize. We all have become great friends. It is a great way to share our adoption stories and keep our children's culture and heritage present in our lives. Leyla Nargiz and Aydan Roxanne both joined our family two years ago in May 2002. Both of them were three years old at the time. Now, upon looking back, it's hard to remember a time when they weren't part of our family. The girls truly are typical family members, doing everything that siblings love to do together. They have blossomed tremendously over these two years and are thrilled to be entering kindergarten this fall. Leyla loves to swim, play with her dolls, color and play with her brothers and sisters. Roxanne loves all kinds of sports. Her favorite toys are a toy horse and her roller blades. She loves running around and playing outside games with her brothers and sisters. We are a rather large family with five children now, but the love we have for one another just keeps growing bigger and bigger! Those interested in learning more about the adoption process in Azerbaijan are invited to join the AZERBAIJANADPT ListServ at YAHOO.com where it is possible to read nearly three years of previous discussions and concerns dating back to 2001. Currently, the group has more than 400 members. Links: Search "Adoption" at AZER.com, the Web site for Azerbaijan International magazine. 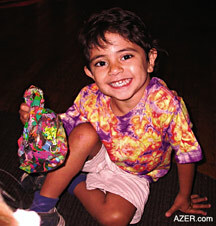 Articles include Inara Abernathy, the first child adopted from Azerbaijan, the previous reunions, and adoption concerns. Also you can find the words and music to the popular children's song "Jujalarim" ("My Little Chicks") as well as the story of its most famous Moscow performance at the "Decade of Azerbaijan Arts" in 1959.